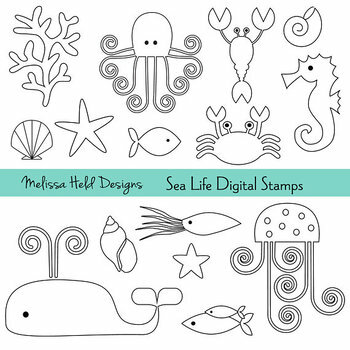 This is a digital stamp clipart collection of cute sea life illustrations by Melissa Held Designs. You can use these icons to create patterns for embroidery projects, as easy to print teaching resources, to create your own coloring books, paper crafts, and scrapbooking. This set includes simple line illustrations of coral, shells, starfish, octopus, lobster, crab, seahorse, whale, fish, squid, and jellyfish. These images have a black outline with transparent fill and also have transparent backgrounds. There are 15 PNG stamps included in this set. Files will come in zip format. You will need a computer to unzip these files and a design/editing program that supports png file formats. This is a copyright free product and may be used commercially except for reselling or redistributing the product as is.